This wizard in zenon carries out the complete configuration of a user interface – from creating the driver to importing the variables. It independently enters configuration parameters into the zenon project. Driver configuration thus becomes considerably simpler and less time consuming. The persons configuring the project can dedicate themselves to their actual tasks without distraction. With the IEC 61850 SSD Import Wizard, you save precious project configuration time when creating overview screens or single-line diagrams. The IEC 61850 SSD Import Wizard reads an SSD file that is already created during the start phase of a project. 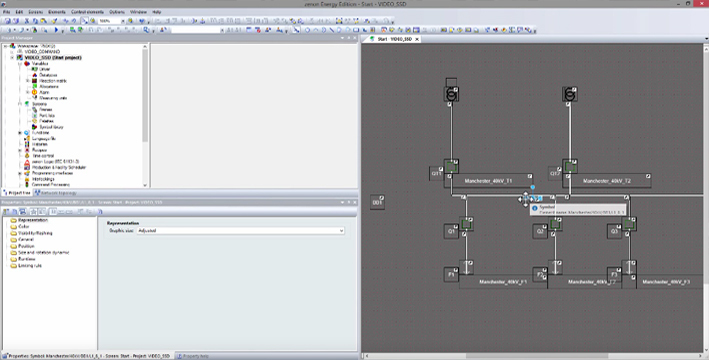 At the press of a button, it draws a single-line diagram in zenon. The wizard recognizes which element must be drawn at which place. Supplied display elements, adapted, or self-created symbol libraries can be used.